It has been tough lately to keep up with the Justices of the Supreme Court and their ethics. Various allegations recently have been lodged against various justices: Justice Scalia (Koch-brothers-conspiring); Justice Thomas (same, and Tea-Party-marrying); Retired Justice Sandra Day O’Connor (robo-calling); and Justice Alito (Spectator-supporting). To be sure, much of this is much ado about nothing, but some of it is about something (try, for instance, the appearance of impartiality), which is why I like and agree with the title of Dahlia Lithwick’s recent piece in Slate — Running with Gavels: Justices Need to Set Clearer Rules About Partisan Political Activity. Click on it for a good current-events survey of the Justices and their political affairs. UPDATE: By agreeing to speak semi-privately to the Tea Party Caucus, Justice Scalia has just upped his bid to be the most controversial Supreme Court Justice in terms of partisanship and disqualification. 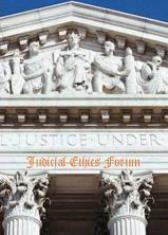 For a good discussion of the issues, click on Legal Ethics Forum.